Since 2012, Alexander Liebreich, one of the most inspired conductors of his generation, has been Artistic Director and Principal Conductor of the Polish National Radio Symphony Orchestra in Katowice. This orchestra, Poland’s cultural ambassador to the world and an European ensemble of great distinction, is particularly associated with the music of Polish composers of the twentieth and twenty-first centuries and is more familiar with the works of Lutosławski and Szymanowski than perhaps any other orchestra in the world. 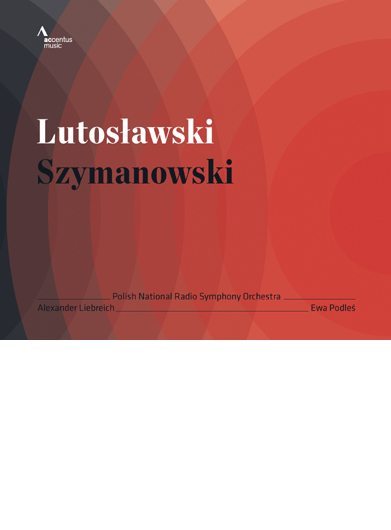 Witold Lutosławski’s opulent and stylistically eclectic Concerto for Orchestra was a triumphal success at its premiere in 1954 and remains his most popular work. With his songs, Karol Szymanowski, one of Poland’s most important composers, made a contribution of great significance to this genre in the twentieth century. His Three Fragments from Poems by Jan Kasprowicz from 1902 impressively convey the poems’ mood of decadence, melancholy, spirituality, and mysticism. Ewa Podlés, a contralto of international stature, has a voice of breathtaking range, volume, and agility. With her uniquely warm and expressive timbre, her performances of works such as Szymanowski’s Three Fragments have enchanted audiences around the world. Click here to listen to audio samples of the CD release!